The other day, I wanted to curb my craving for peanut butter while still managing to eat a balanced lunch. Enter this quick, homemade Thai peanut dressing, which I poured over roasted chicken pieces on a bed of crunchy veggies. Plus, thanks to a package of PBfit, I got all the peanut butter flavor I wanted without all the extra calories. PBfit is whole-roasted peanuts, pressed into a powder. It contains up to 90 percent less fat than traditional peanut butter and about 1/3 the calories. I liked the concept of being able to enjoy peanut butter flavor without adding too much to my overall fat and calorie intake. Inspired by the chicken satay with peanut dipping sauce from my local Thai restaurant, I cut up a leftover roasted chicken breast and whisked up the PBfit, rice wine vinegar, toasted sesame oil, sunflower oil, soy, Sriracha and a touch of water. 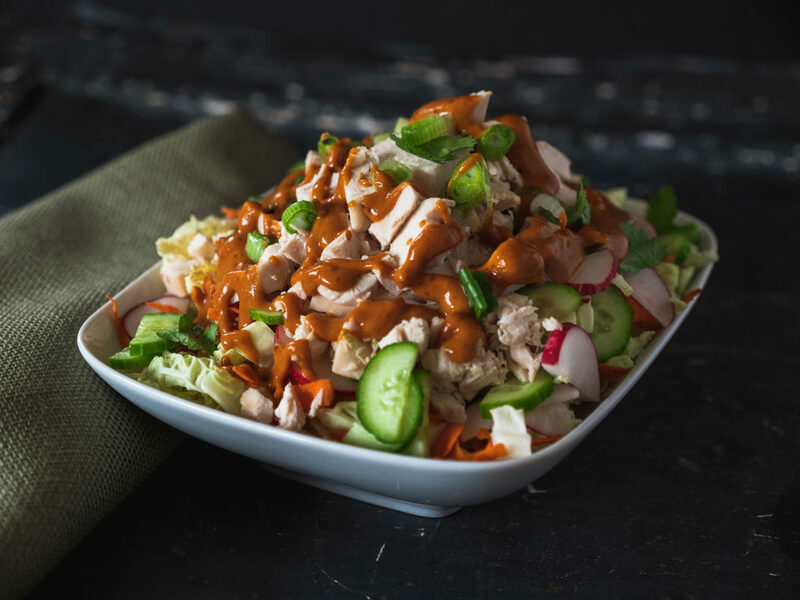 I put the chicken atop of a bed of veggies, including Napa cabbage, carrot, cucumber, radish, scallions and cilantro; then, I drizzled on the peanut dressing. This recipe serves two as a meal but can easily be a side salad for a crowd. You don’t have to use chicken. Baked tofu, pork, beef or even seafood, would work great. Toss it with cold noodles, as in a Vietnamese bun bowl, for a little fun carb action. It’s great if you’re into meal prep. Portion out the salad and protein in one container and the dressing in another. Be sure to keep the dressing separate until you’re ready to eat. The veggies will stay fresh in sealed containers for 3-5 days. In a medium sized bowl, whisk together the PBfit, water, rice wine vinegar, sesame oil, sunflower oil, Sriracha and soy sauce. Set aside. In a large bowl, toss together the cabbage, radishes, cucumber, carrot, scallions and cilantro. Divide the vegetables between two bowls. Top each serving with 1 cup of diced chicken breast. Drizzle each portion with some of the peanut dressing and enjoy!